I am a red man. If the Great Spirit had desired me to be a white man he would have made me so in the first place. He put in your heart certain wishes and plans, in my heart he put other and different desires. Each man is good in his sight. It is not necessary for Eagles to be Crows. We are poor… but we are free. No white man controls our footsteps. If we must die…we die defending our rights. It is not easy to characterize Sitting Bull, of all Sioux chiefs most generally known to the American people. There are few to whom his name is not familiar, and still fewer who have learned to connect it with anything more than the conventional notion of a bloodthirsty savage. The man was an enigma at best. He was not impulsive, nor was he phlegmatic. He was most serious when he seemed to be joking. He was gifted with the power of sarcasm, and few have used it more artfully than he. His father was one of the best-known members of the Unkpapa band of Sioux. The manner of this man’s death was characteristic. 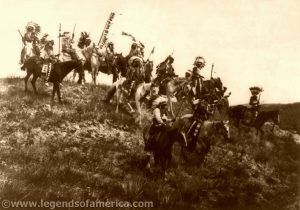 One day, when the Unkpapa were attacked by a large war party of Crow, he fell upon the enemy’s war leader with his knife. 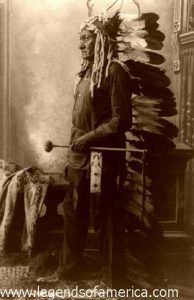 In a hand-to-hand combat of this sort, we count the victor as entitled to a war bonnet of trailing plumes. It means certain death to one or both. In this case, both men dealt a mortal stroke, and Jumping Buffalo, the father of Sitting Bull, fell from his saddle and died in a few minutes. The other died later from the effects of the wound. Sitting Bull’s boyhood must have been a happy one. It was long after the day of the dog-travaux, and his father owned many ponies of variegated colors. It was said of him in a joking way that his legs were bowed like the ribs of the ponies that he rode constantly from childhood. He had also a common nickname that was much to the point. It was “Hunkeshnee”, which means “Slow,” referring to his inability to run fast, or more probably, to the fact that he seldom appeared on foot. In their boyish games he was wont to take the part of the “old man”, but this does not mean that he was not active and brave. It is told that after a buffalo hunt the boys were enjoying a mimic hunt with the calves that had been left behind. A large calf turned viciously on Sitting Bull, whose pony had thrown him, but the alert youth got hold of both ears and struggled until the calf was pushed back into a buffalo wallow in a sitting posture. The boys shouted: “He has subdued thebuffalo calf! He made it sit down!” And from this incident was derived his familiar name of Sitting Bull. It is a mistake to suppose that Sitting Bull or any other Indian warrior, was of a murderous disposition. It is true that savage warfare had grown more and more harsh and cruel since the coming of white traders among them, bringing guns, knives, and whisky. Yet it was still regarded largely as a sort of game, undertaken in order to develop the manly qualities of their youth. It was the degree of risk which brought honor, rather than the number slain, and a brave must mourn thirty days, with blackened face and loosened hair, for the enemy whose life he had taken. While the spoils of war were allowed, this did not extend to territorial aggrandizement, nor was there any wish to overthrow another nation and enslave its people. It was a point of honor in the old days to treat a captive with kindness. The common impression that the Indian is naturally cruel and revengeful is entirely opposed to his philosophy and training. The revengeful tendency of the Indian was aroused by the white man. It is not the natural Indian who is mean and tricky; not Massasoit but King Philip; not Attackullakulla but Weatherford; not Wabashaw but Little Crow; not Jumping Buffalo but Sitting Bull! These men lifted their hands against the white man, while their fathers held theirs out to him with gifts. Remember that there were councils which gave their decisions in accordance with the highest ideal of human justice before there were any cities on this continent; before there were bridges to span the Mississippi; before this network of railroads was dreamed of! There were primitive communities upon the very spot where Chicago or New York City now stands, where men were as children, innocent of all the crimes now committed there daily and nightly. True morality is more easily maintained in connection with the simple life. You must accept the truth that you demoralize any race whom you have subjugated. Sitting Bull, 1888. Click for prints, downloads and products. From this point of view, we shall consider Sitting Bull’s career. We say he is an untutored man: that is true so far as learning of a literary type is concerned; but he was not an untutored man when you view him from the standpoint of his nation. To be sure, he did not learn his lessons from books. This is second-hand information at best. All that he learned he verified for himself and put into daily practice. In personal appearance he was rather commonplace and made no immediate impression, but as he talked he seemed to take hold of his hearers more and more. He was bull-headed; quick to grasp a situation, and not readily induced to change his mind. He was not suspicious until he was forced to be so. All his meaner traits were inevitably developed by the events of his later career. 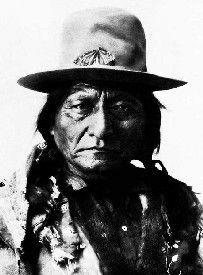 Sitting Bull’s history has been written many times by newspaper men and army officers, but I find no account of him which is entirely correct. I met him personally in 1884, and since his death, I have gone thoroughly into the details of his life with his relatives and contemporaries. It has often been said that he was a physical coward and not a warrior. Judge of this for yourselves from the deed which first gave him fame in his own tribe, when he was about twenty-eight years old.